Ever since the economic and financial crises of the late 2000s – also known as the Great Recession –, demands for structural reforms to ease market regulations have been omnipresent in Europe. A particular emphasis has been placed on labor market regulations – involving heated political debates. A recent IAB study shows that the effects of labor market reforms heavily depend on the timing of the reform. The German government implemented large-scale structural labor market reforms in the years 2003 to 2005 to fight high and upward trending unemployment rates. The upward trend in unemployment until 2005 in Germany is illustrated in the figure below. The German labor market with unemployment rates of above 10 percent (according to the ILO concept) became known as the “sick man of Europe” in these years. The reforms aimed at increasing labor market flexibility, improving the matching of unemployed workers and job vacancies, and decreased unemployment benefits and their duration. Ever since, the unemployment rate in Germany has almost steadily been falling as illustrated in the figure below. Even the Great Recession in 2008/09, that led to an enormous decline in the growth of the domestic product in Germany, hardly affected the labor market in an adverse way. In contrast, the labor markets in Italy and Spain experienced a very different development. In the mid-2000s, unemployment rates were at similar levels compared to Germany. 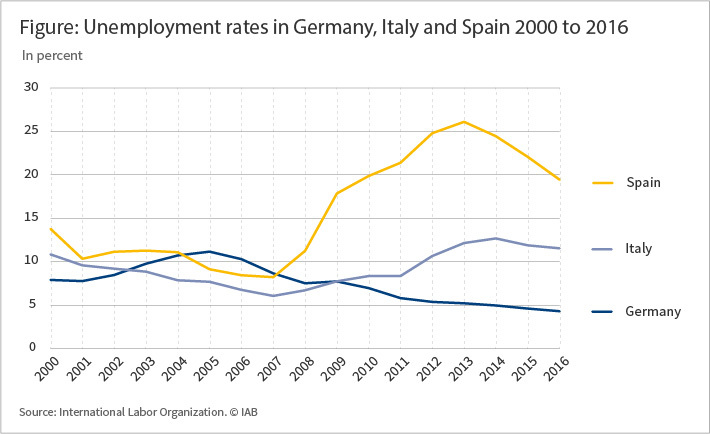 However, the trend in Italy and Spain was decreasing (s. figure below), whereas unemployment was increasing in Germany until 2005. Yet after the Great Recession hit, unemployment rates in Italy and Spain started to rise tremendously. This development was aggravated by the debt crises in Europe after the Great Recession. In Spain, unemployment peaked at more than 25 percent in 2013. In Italy, unemployment rates have remained higher than 10 percent from 2012 onward. In response to the economic crisis and the high unemployment rates, both Spain and Italy implemented large scale labor market reforms, as Germany had done some years before. The Spanish reforms in 2010 and 2012 flexibilized wage setting and reduced employment protection with the aim of bringing down unit labor costs and increasing labor market flexibility. Similarly, in Italy in 2012 and 2014/2015 employment protection was substantially reduced. However, as of today the reforms in Spain and Italy were not followed by as positive effects on the labor markets as the German reforms. Unemployment remains high in these countries relative to pre-crisis levels. For a review of the reforms and their effects see among others the 2012 study by Samuel Bentolila et al. for Spain, the 2015 OECD study for Italy, and the 2016 studies by Sabine Klinger and Enzo Weber and Andrey Launov and Klaus Wälde for Germany. A recent IAB study shows that these different reform experiences can be explained by the particular timing of the reforms. Labor market reforms that are implemented in times of economic crisis while the demand is low have weaker short-run effects compared to reforms that are implemented in an expansionary phase of the business cycle. Reforming during recessions may even entail short-term costs even though the long-run effects are positive. These results emerge from an empirical time series model that identifies the effects of labor market reforms in good and bad states of the business cycle. There are two key types of structural reforms: components that affect the matching of unemployed workers and firms with job vacancies and components that foster job creation at the firm level. Intuitively, the first component captures reforms connected to labor supply, whereas the second component relates to labor demand (see box “Our study approach”). The empirical approach simultaneously addresses two challenges when analyzing reform effects over the business cycle. First, a time series approach can exploit the information on the labor market performance in different recessions and expansions that only long-time series data provides. Second, the econometric model explicitly identifies components that comprise the different reform effects. The econometric model framework is specified with regard to the established search and matching theory. The model links matching and job creation to unemployment, vacancies, productivity, wages and surplus expectations, while simultaneously isolating the components not explained by these linkages. It is these components, i.e., matching efficiency and job creation intensity, which absorb unobserved reform effects in labor supply and demand, respectively. Intuitively, the components not explained by direct economic relationships are interpreted as the impact of policy, i.e., reforms. In addition to this theoretical anchoring, two further steps ensure that the measure of reforms is economically interpretable. First, the time series model extracts structural reform components in matching efficiency and job creation intensity that have permanent effects while controlling for transitory components that may potentially arise from business cycle influences. Second, potential effects from sectoral change, mismatch and a changing structural composition of the pool of unemployed, e.g. with regard to qualification, age, or the length of the unemployment spell are explicitly filtered out. The case of Germany offers a unique setting for the study: First, Germany has experienced large labor market restructuring in recent years in both recessions and expansions. Second, Germany provides very detailed and high-quality labor market data that aligns with the theoretical model requirements. The results on German data for the last 30 years show that reforms that improve the matching process have indeed substantially weaker effects in recessions than in expansions. In extreme cases, the positive effects of structural labor market reforms are completely offset in the short run if implemented in recessions. For reforms in job creation, the dampening is less pronounced. Notably, this result is not specific to Germany. Estimates on data for Spain confirm that comparable asymmetries exist in the Spanish labor market: labor market reforms in recessions have weaker short-run effects compared to reforms that are implemented in expansions. This similarity is remarkable given that the aggregate performance of the Spanish economy in terms of up- and downturns and the development of the unemployment rate was very different compared to Germany. In Spain, the dampened reform effect in recessions turns out to be more pronounced in terms of the job creation intensity. This finding is reassuring in that the result is not simply country-specific, but of general interest. An alternative, potentially more standard approach, to measure reforms is by using observed indicators of labor market regulations. Examples include replacement rates in case of unemployment benefit receipt or indices of employment protection legislation. While observed indicators have the advantage of clear interpretability, the new identification resolves some of the many difficulties connected to the usage of these observed indicators. Standardized indicators have difficulties to measure the strength of reforms and to correctly reflect the timing. Further, only a limited part of legislation can be defined in such a standardized way as captured by the indicators. In contrast, the new identification of reforms provides a big picture and very comprehensive measures of reforms. Nevertheless, a comparison of the unobserved reform components to observed indicators finds considerable co-movements. Reforms in matching efficiency and job creation intensity occurred in periods when substantial structural changes as measured by the employment protection indices or the replacement rates of the OECD took place. For example, matching efficiency improved substantially in Germany after the 2003-2005 reforms. We established a strong interaction of the business cycle and structural labor market reforms: Reforms affecting labor market mechanisms turn out to be less effective in recessions. Interestingly, the optimal timing of labor market reforms is thus the opposite compared to what is often found for fiscal policy. The fiscal policy literature argues that expansionary government spending or tax cuts directly stabilize demand in economic downturns and can be more beneficial in recessions. Similar observations have been documented in the context of short-time work. These results call for a close monitoring of the business cycle when introducing structural labor market reforms. Implementing reforms to alleviate crisis situations turns out to be a costly policy. Even though long-run effects of structural reforms are beneficial, the short-run costs may erode the public support for such reforms and even worsen the crisis situations. Instead, as the example of the German labor market reforms before the Great Recession has shown, implementing reforms outside recession periods promises to be more effective and to avoid adverse effects of reform efforts put forward under pressure of a deep economic downturn. (Even if the German labor market found itself in a problematic situation when the reforms were implemented, there was no recession by that time.) Indeed, the upward trend in the labor market when Germany entered the recession was one major reason why a drop in employment could be avoided as shown by Enzo Weber’s 2015 study. Of course, crises show the need for reforms most markedly. Therefore, identifying the right reforms in normal times requires a good understanding of the development of the labor market and its structures. From a political economy point of view, these findings provide both a negative and a positive conclusion. On the negative side, they explain the reluctance of governments in crisis countries to conduct profound reforms. The adverse short- to medium-run effects disincentivize such a strategy. However, the results also show that outside recessions positive reform effects can be expected to materialize much quicker and can thus encourage public support of unpopular reforms. Resolute action in the first half of a legislative period can thus benefit the reformer who is confronted with the challenge to explain the need for decisive reform steps in the absence of immediate pressure through a crisis. Bentolila, Samuel, Dolado, Juan J., & Jimeno, Juan F. (2012). Reforming an insider-outsider labor market: the Spanish experience. IZA Journal of European Labor Studies, 1(1), 4. Gehrke, Britta, & Weber, Enzo (2017). Identifying asymmetric effects of labor market reforms. IAB Discussion Paper 23/2017. Klinger, Sabine, & Weber, Enzo (2016). Decomposing Beveridge curve dynamics by correlated unobserved components. Oxford Bulletin of Economics and Statistics, 78(6), 877-894. Launov, Andrey, & Wälde, Klaus (2016). The employment effect of reforming a public employment agency. European Economic Review, 84, 140-164. OECD (2015). „Structural reforms in Italy: impact on growth and employment“. 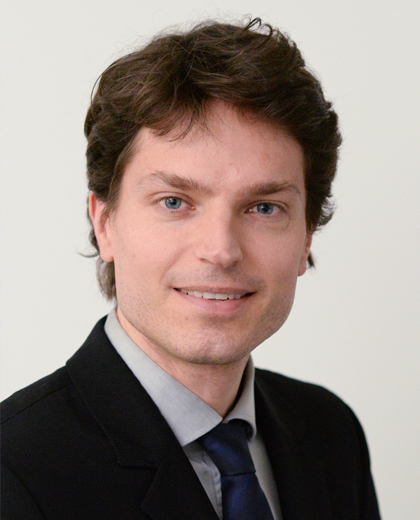 Weber, Enzo (2015). The labour market in Germany: Reforms, recession and robustness. De Economist, 163, 461-472. 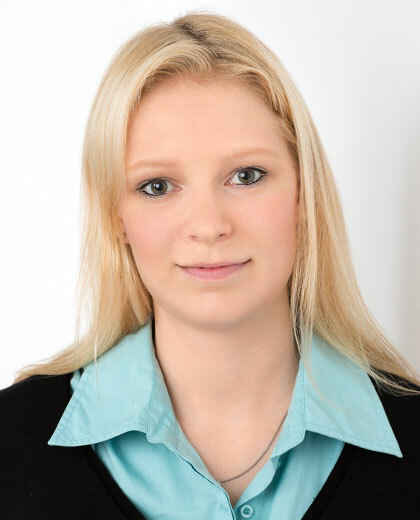 In 2015, she was appointed assistant professor (Juniorprofessorin) for macroeconomics and labor markets by the University of Erlangen-Nuremberg and by the Institute for Employment Research (IAB).